It's going to be fun with these 10 ski spots in & around the Okanagan. People come from all over to enjoy the world class ski spots in and around the Okanagan. But if you are reading this, you may be one of those lucky people who actually lives here! If so, here is your comprehensive list of nearby mountain resorts that you should make a point of visiting this winter. If you are a visitor to the area, I hope this list is helpful and helps you explore all the winter adventures that this part of the world has to offer. Your classic, close to home mountain with great downhill, snowboarding and cross country skiing. A 25 minute drive from downtown. 1 hour and 20 minutes from downtown Vernon, this mountain offers 118 runs as well as cross country skiing. 2 hours from Vernon, protected from the mild, coastal weather by the Coast Mountains, they receive on average nearly 6 metres of light, dry, 'easy-to-ski' powder. Sounds good to me. Only an hour and 47 minutes from Vernon, Harper Mountain is smaller than your standard resort, but has cheaper lift tickets too! It's always great to have an excuse to visit Revelstoke, so why not make the 2 hour drive? This mountain offers something for everyone: begginers and experts. Also, make sure to end your trip with a soak in one of the nearby hot springs! 2 hours and 20 minutes south, Apex Mountain is a full service destination resort known for the lightest champagne powder snow, incredible terrain, and friendly people. This mountain seems to be closed at the moment, but they say to stay tuned! 3 hours away. Phoenix Mountain is a small ski resort in the Boundary Country, 3 hours south of Vernon, near Grand Forks and Greenwood. Phoenix provides terrain for all skill levels ranging from beginner to advanced and has a unique community atmosphere and claims to be "The Best Little Mountain in BC"! Furthest away yet, at 4 and a half hours, is Red Mountain Resort in the Kootenays, which I am sure will amaze with the remote setting and breathtaking mountains. 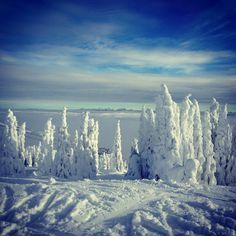 They claim to have the best tree runs in BC. I will let you be the judge of that. 10. Kingfisher Heliskiing out of Cherryville. You're on your own for that one... but send me pictures!